If there's anything in the world that will brighten up a preschooler's day.... it's water play. Water is seriously magical. Give a kid a bucket of water, a pool, a water gun, or a hose... and bam! Laughter and good times are bound to be in your future! Today 4 other creative preschool bloggers and I are sharing some really easy and engaging water activities. You can find the entire list at the bottom of this post! In our home, we've really loved making Ocean Crafts and rainy day process art. So I thought it would be fun to combine the two with this fun Ocean Process Art Activity! We got a chance to use a whole bunch of art materials (including water guns) to create some ocean-inspired artwork. 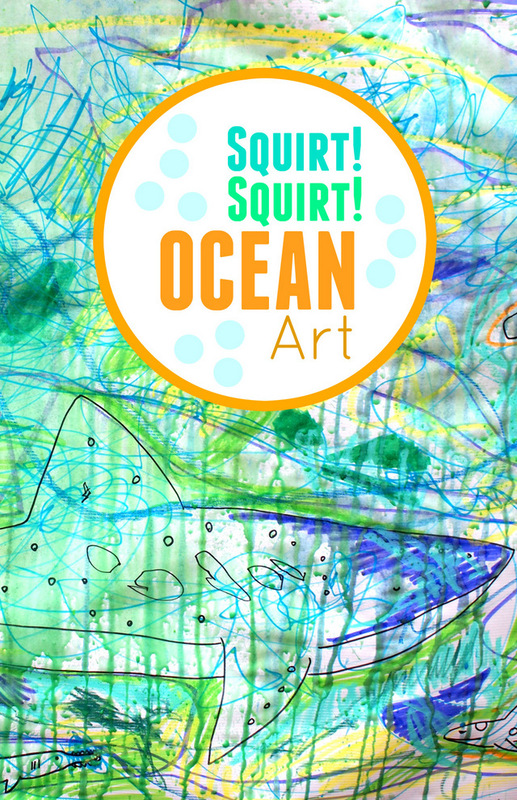 Squirt, Squirt Ocean Process Art! To start off, I taped down a large sheet of white kraft paper onto the floor. We're still fascinated by sharks, so I doodled some of those using Sharpies . Then, I gave Chuck Sharpies, regular markers, and oil pastels . He added details and colors to my plain shark design. Once we finished our artwork, I took it outside and taped it to the fence. We pulled out our water guns and spray bottles and filled them with a 50:50 solution of water and tempera paint . Then we just went at it and sprayed some more color to our artwork! This was Chuck's favorite part. :) Understandable, right? Who wouldn't love shooting a water gun filled with colorful liquid? We made blue and green paint because they reminded us of the ocean. But next time we'll try more colors! I really hope you have fun trying out this activity with your kids too! Chuck doesn't always like crafting with me, but he already requested to do this activity again! Score! 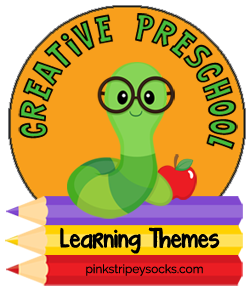 And here are some other really fun preschool water activities!